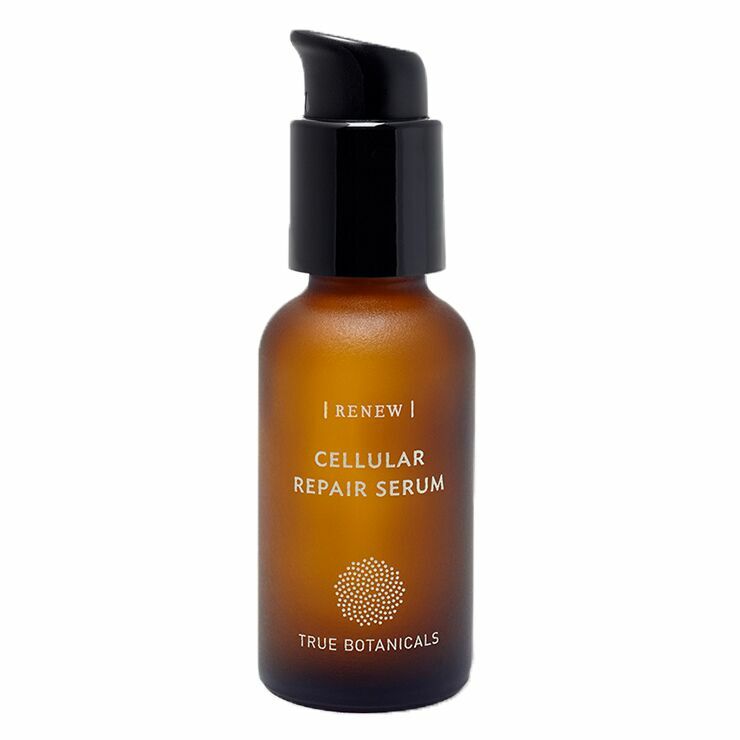 True Botanicals Renew Cellular Repair Serum visibly improves sun damage and signs of aging overnight. Antioxidant rich seaweed and green tea diminish signs of inflammation and lend a feeling of repair and protection to stressed skin. Noni fruit extract instills a calming sensation to dry, irritated, damaged skin, while resveratrol makes the complexion look revitalized and youthful. Ceramides are used to make the skin feel soft and hydrated, and French melon evens the appearance and diminishes signs of discoloration. Apply a thin layer of the anti aging, sun damage serum to face, neck, and chest after cleansing and moisturizing skin. For best results, use nightly. True Botanicals Bioferment™ [Water, Alaria (Seaweed), Sodium Choride], Camellia Sinensis (Green Tea) Leaf Extract*, Citrus Aurantium Amara (Neroli) Flower Water, Glycerin (Vegetable Glycerin)*, Morinda Citrifolia (Noni) Fruit Extract, Resveratrol (From Japanese Knotweed), Superoxide Dismutase (An Antioxidant), Algin (Seaweed), Leontopodium Alpinum (Edelweiss) Flower/Leaf Extract, Tamarindus Indica (Tamarind) Extract, Macrocystis Pyrifera (Kelp) Extract, Magnesium Ascorbyl Phosphate (Vitamin C), Glucosamine, Niacinamide, Astaxanthin (From Red Pond Algae), Algae Extract, Simmondsia Chinensis (Jojoba) Seed Oil, Carnosine (An Antioxidant), Ubiquinone (An Antioxidant), Tocopherol (Non-GMO Vitamin E), Magnesium Chloride, Palmitoyl Tripeptide-5, Tripeptide-29, Ceramide 3, Ceramide 6 II, Ceramide 1, Tetradecyl Aminobutyroylvalylaminobutyric Urea Trifluoroacetate (Synthetic Tripeptide), Phytosphingosine (A Lipid), Sodium Lauroyl Lactylate (A Fatty Acid), Carbomer, Enteromorpha Compressa (Algae) Extract, Caesalpinia Spinosa (Tara) Gum, Sodium Hyaluronate (Hyaluronic Acid), Glycoproteins, Beta-Glucan, Calcium Carbonate, Calcium Citrate, Calcium Malate, Magnesium Citrate, Magnesium Oxide, Zinc Citrate, Decyl Glucoside (Glucose Based Emulsifier), Lecithin, Xanthan Gum, Cholesterol, Phenethyl Alcohol**, Ethylhexylglycerin**, Jasminum Officinale (Jasmine) Oil, Jasminum Sambac (Jasmine) Flower Extract, Citrus Aurantium Amara (Neroli) Leaf/Twig Extract, Citrus Aurantium Amara (Bitter Orange) Oil, Citrus Aurantium Amara (Petitgrain) Peel Oil, Polianthes Tuberosa (Tuberose).